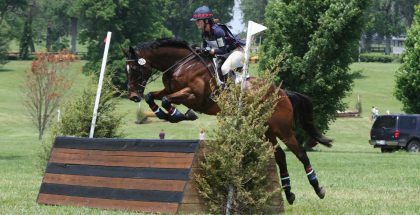 Rebekah and Saber: An OTTB Story by Casey Laughter– Sometimes horses are not meant to do the job they are bred to do. Sometimes, racehorses are not always as fast as their papers and breeding would imply. This is a major reason why Merlin’s Wand was never a winning racehorse. As a gelding, the breeding shed was out of the question, so a second career was in order. 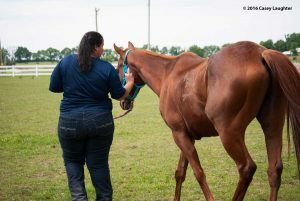 Retraining and working with OTTBs is a tough, time-consuming job. However, Rebekah Engle was willing to take the challenge. OTTBs have a reputation for being hot headed, dangerous, and insane; Saber is quite the contrary. Had Rebekah listened to the false accusations about OTTBs, she would not have an amazing partner like Saber. 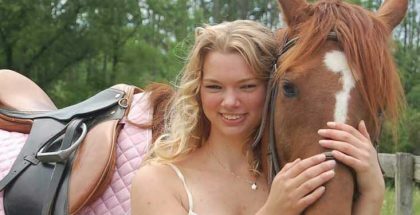 After having her second child at age 20, Rebekah was wanting to push herself even further by purchasing an untrained horse. 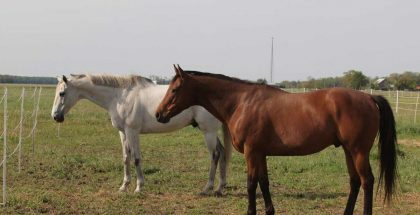 While scrolling through the Internet, Rebekah came across a sorrel gelding, “with a hip to die for.” Having never worked with thoroughbreds, Rebekah figured she should at least give this horse a look, as she could not get him out of her head. Rebekah decided to contact the owner of the horse and make an offer. Unfortunately for Rebekah, it was not accepted. After having her offer for the red gelding rejected, Rebekah returned to the Internet in search of her next horse. After a few days and a continued search, her phone rang out of the blue. It was the owner of the little red gelding! They wondered if the offer for the gelding still stood and if Rebekah would want to come meet the horse. Of course! 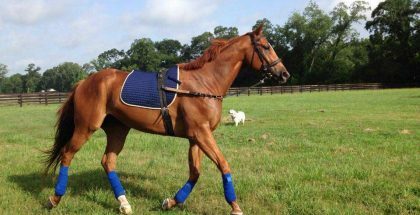 After telling her mother and fiancé, who were skeptical of OTTBs, the trip was planned. Rebekah and her fiancé were going to take the forty-minute drive and go see this horse. After a few days of waiting, restlessness, and no sleep, Rebekah was on her way to see her future horse, even if it was not set in stone just yet. After arriving in the town of Piqua, Ohio, Rebekah was not expecting the sight she happened upon. 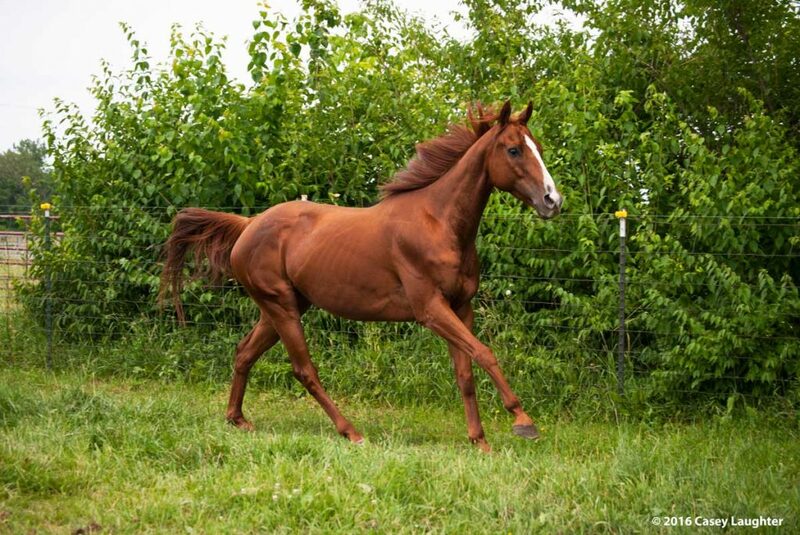 That beautiful red gelding in the photos was seemingly a different horse. 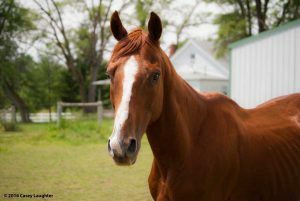 The gelding she saw in front of her had no energy, was as calm as an old, 30-year-old horse, and had large bumps all over him. While the bumps were enlarged blood vessels, it was still an unappealing sight. Rebekah was skeptical now, but did not want to leave the horse wondering if she had walked away from potentially her next partner. She was allowed to ride him in the grassy yard on the property. After 15 minutes, Rebekah dismounted and was quiet as she entered the barn with the owner and her fiancé. A bond grows between horse and rider with trust, time, and commitment. All these factors came into play at Rebekah and Saber grew together as horse and rider. “So, what do you think?” asked the owner. “I’ll take him!” Rebekah blurted out, taken back by her impulsivity. When Merlin’s Wand finally arrived home to Rebekah and her young family, a name change was in order. Rebekah’s younger brother chose the name Saber, which was the type of sword Calvary carried when riding. A bond grows between horse and rider with trust, time, and commitment. All these factors came into play at Rebekah and Saber grew together as horse and rider. While Saber proved to be a “hard keeper,” he also proved that he was not hot headed, crazy, or dangerous. Like all horses or any breed or profession, Saber has his good days and his bad days. Saber, however, is the smartest, most loyal, dedicated and sweet horse. Breeders’ Cup 2016: Where Does Frosted Belong?